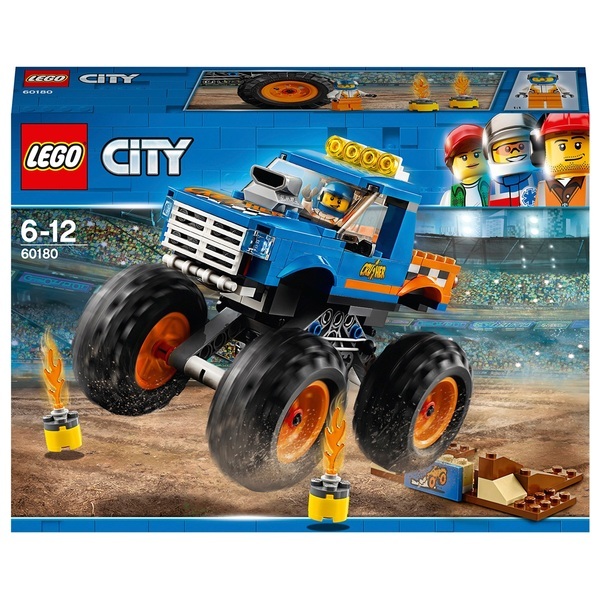 Show off your stunts with the LEGO City 60180 Monster Truck! With massive wheels and working suspension, this build is perfect for young monster truck fans. Create your own obstacles with the LEGO City 60180 Monster Truck. This set comes with a buildable ramp and 2 buildable fire barrels, so you can put together the perfect course for your monster truck stunts. Seat the minifigure in the cab, helmet on and ready to race. Then launch the monster truck off the ramp to soar over the flaming fire barrels! The oversized wheels and working suspension are perfect for making that jump and landing like a pro. Become a legend of the monster truck show with the LEGO City 60180 Monster Truck. This colourful monster truck build features epic styling in contrasting blue and orange, so you can keep crushing it in style. This awesome monster truck is designed for action and perfect for creative play. Imagine racing other trucks, freestyling at monster truck shows and performing incredible jumps ad stunts with the LEGO City 60180 Monster Truck. Monster truck fans will have hours of build and play fun with this cool LEGO City set.